BMW began in 1916 when the aircraft engine manufacturer Rapp Motorenwerke was reorganized to become BMW. This was done at a time when the First World War was at its height. At the end of the war the Treaty of Versailles banned the German Air Force and the German aircraft manufacturing industry. Thus it was that BMW found themselves as an aircraft engine manufacturer banned from making aircraft engines, which was a bit awkward. The solution was to use their engine design expertise and manufacturing capability and channel those resources into making new products that were not banned. So BMW started out making engines for industrial applications, air brakes, agricultural machinery and even office furniture before they decided that they might actually be rather good at making motor cars and motorcycles. They were, and they became one of the most respected automotive makers in the world. 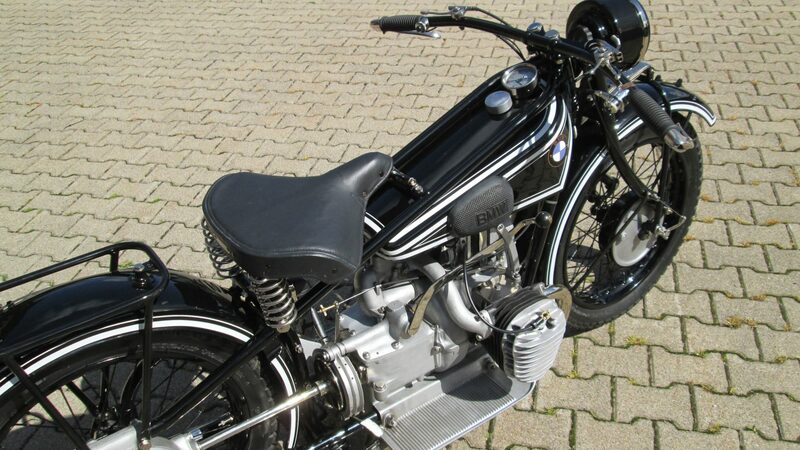 The horizontally opposed two cylinder engine would become the iconic BMW motorcycle engine. Back in 1921 BMW engineer Max Fritz had noticed the British Douglas motorcycle owned by one of his foreman, a man named Martin Stolle. Max Fritz asked Stolle if he wouldn’t mind him borrowing his motorcycle for a while and I guess if the boss wants to borrow your bike and strip it down to reverse engineer it you say “of course boss, anything you like” and get used to catching the bus to and from work for a while. Max Fritz stripped down Martin Stolle’s bike and reverse engineered it so he could create BMW’s first motorcycle engine, the M2B15. During that time BMW had also bought the Helios Motorcycle company and obtained their designs so between Max Fritz efforts at reverse engineering the works foreman’s Douglas motorcycle engine and the getting of the Helios designs and manufacturing capacity BMW were in a position to create their first motorcycle and create one they did. It was called the R32 and it made its debut in 1923. The BMW R52 was the final development of the original R32 and came after the R42, each being an improved design based on its predecessor. We don’t know if Max Fritz bought Martin Stolle a new pair of boots to thank him for all those walks to the bus stop, bosses can be less grateful than we’d like them to be sometimes. But the sacrifice and the effort were well worth it and the R32 motorcycle that emerged from Max Fritz’s design work was not only the first BMW motorcycle but it was the motorcycle that established the essential design concept that BMW would use all the way through into their R series of the present day. 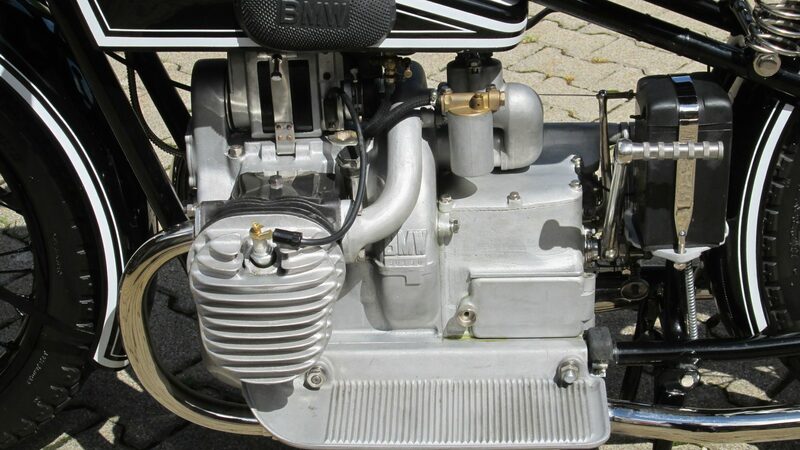 The R32 motorcycle had a horizontally opposed air cooled engine with a shaft drive and the cylinders laid across the frame so they were fully in an unobstructed air flow, which is exactly what you will find in a BMW R series motorcycle of today. The BMW R52 gear lever is located along the right side of the fuel tank and connects directly into the gearbox. 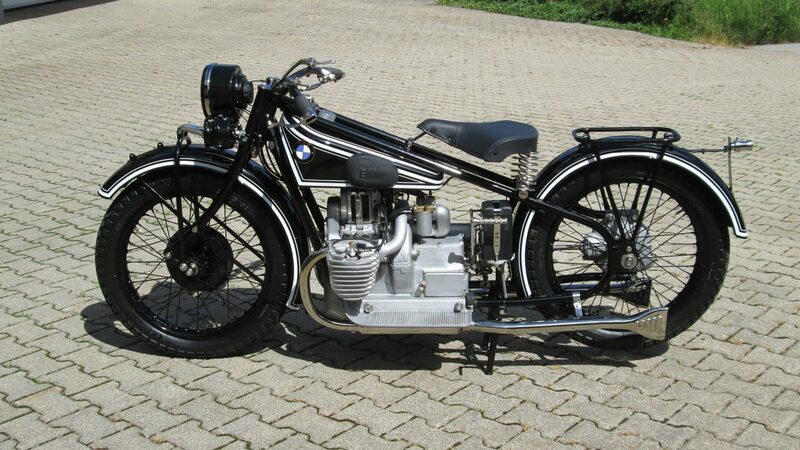 The original BMW R32 had an engine of 486cc producing a modest but reasonable 8.5hp which gave the bike an adequate top speed of around 60mph. The engine and gearbox were bolted together as a single unit and the design was and is modern and forward thinking. Engine lubrication was by a wet sump with a drip feed system to the roller bearings of the crankshaft. A system that BMW kept using until 1969, it wasn’t broke so they sensibly didn’t see a need to “fix” it. The R32 was updated in 1926 with detachable cylinder heads and those cylinder heads were given fins to assist with cooling. This was the R42 and it would be in production until replaced by the R52 in 1928. The R42 introduced a drum brake for the front and an interesting brake on the drive shaft to serve as a rear brake as can be seen on the photograph of the R52 in the picture above. The rear brake was operated by a contracting friction band. The BMW R32, R42, and R52 all share the same construction and appearance. They are neat, no nonsense motorcycles with a rugged practical design that would go on to make them popular and trusted. Note the kick starter at the rear of the gearbox. 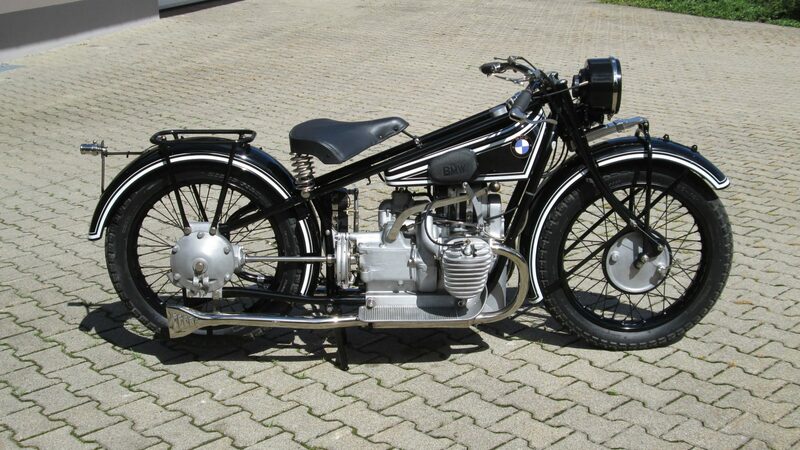 In 1928 BMW brought out the R52 as the final development of this first of the R Series. A 750cc engine option was made available and the R52 had electric lights as standard. The R52 had a new gear change lever that connected directly into the gearbox and the re-designed gearbox also had a new kick-starter fitted at its rear (see pictures above and below). This makes the R52 the most refined of all these first R Series. 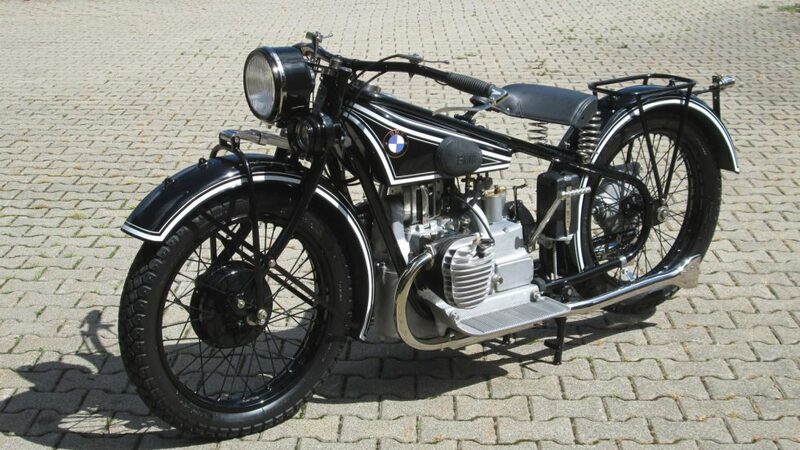 The R52 was introduced in 1928 and it was the first BMW motorcycle to have electric lights as standard equipment. 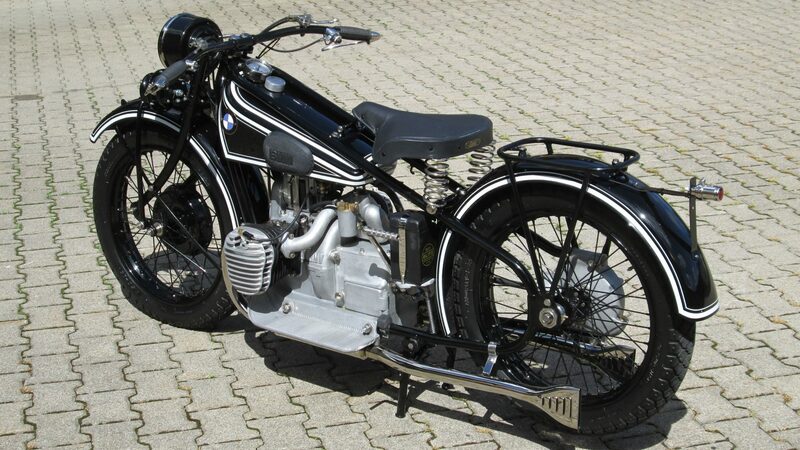 The BMW R52 was only made for two years, 1928 and 1929, and because of its short production run these motorcycles are quite rare. The R52 in our pictures has been fully restored and judging from the photographs the quality of that restoration has been excellent. The bike is coming up for sale by Mecum Auctions at their Las Vegas sale to be held over January 25th-28th 2017 in Las Vegas. 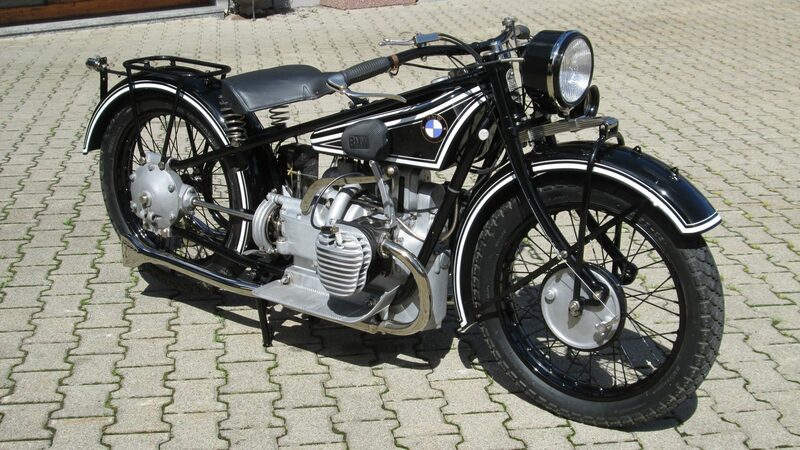 These early examples of BMW’s first efforts at making motorcycles are not common and finding one that has been so professionally restored is unusual. This represents an opportunity to acquire a very attractive looking example of the best of BMW’s first production motorcycles.